Identifies the most centrally located feature in a point, line, or polygon feature class. 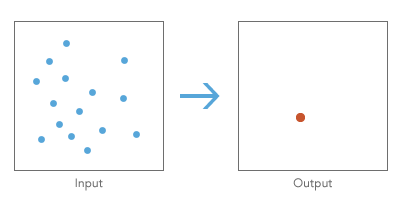 The feature associated with the smallest accumulated distance to all other features in the dataset is the most centrally located feature; this feature is selected and copied to a newly created Output Feature Class. It is possible to have more than one feature sharing the smallest accumulated distance to all other features. When this happens, all of these most centrally located features are copied to the Output Feature Class. Accumulated distances are measured using Euclidean distance or Manhattan distance , as specified by the Distance Method parameter. The Case Field is used to group features for separate Central Feature computations. The Case Field can be of integer, date, or string type. Records with NULL values for the Case Field will be excluded from the analysis. Self-potential is the distance or weight between a feature and itself. Often this weight is zero, but in some cases you may want to specify another fixed value or a different value for every feature (perhaps based on polygon size, for example). The feature class containing a distribution of features from which to identify the most centrally located feature. The feature class that will contain the most centrally located feature in the Input Feature Class. The numeric field used to weight distances in the origin-destination distance matrix. The field representing self-potential—the distance or weight between a feature and itself. Field used to group features for separate central feature computations. The case field can be of integer, date, or string type. The following Python window script demonstrates how to use the CentralFeature tool. The following stand-alone Python script demonstrates how to use the CentralFeature tool. Feature geometry is projected to the Output Coordinate System prior to analysis.